Highlights from the Big Church Day Out 2018. Featuring interview with Housefires and music from Travis Greene. You too can become an AUDIENCE MEMBER at one of our various live recordings. You too can become a VOLUNTEER at TBN UK. Contact us for more. 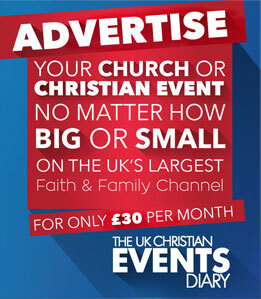 The UK Christian Events Diary is an exciting opportunity for your church or Christian event to reach each one of the 26 million homes and 64 million people that can receive TBN UK. Our aim is to help share your events or regular services, no matter how big or small, to the wider Christian family across all denominations throughout the UK. The UK Christian Events Diary is broadcast in short segments during our morning, midday and evening prime time schedules and will have a national/regional focus. I consent to the processing of my personal data by TBN UK with its registered office in The United Kingdom at 226 Church Road, Willesden, London NW10 9NR, in order to provide services available on the site tbnuk.org. Thanks for what you do. God bless you all!! Listening to @EmmanuelZiga preaching right now on the topic of Faith for APPRECIATION on @TBNUKtv. If anyone has been there for you it's ⏱ to show appreciation!